The main goal of this project is to develop a state-of-the-art data assimilation system that incorporates near-realtime data with which we can provide the community a high quality ocean state product. This assimilation system consists of an Ensemble Filter applied to GFDL’s second generation fully coupled climate model (CM2.1, Delworth et al. ). The ocean component of the coupled data assimilation (CDA) is the fourth version of the Modular Ocean Model (MOM4, Griffies et al. ) configured with 50 vertical levels (22 levels of 10-m thickness each in the top 220 m) and 1° horizontal B-grid resolution, telescoping to 1/3° meridional spacing by 1° near the equator. To the right is a cartoon from Zhang et al. . It illustrates how a two-step data assimilation procedure works for updating the estimate of the probability distribution of a single state variable x given a single observation y in the ensemble adjustment filter under the least squares framework. 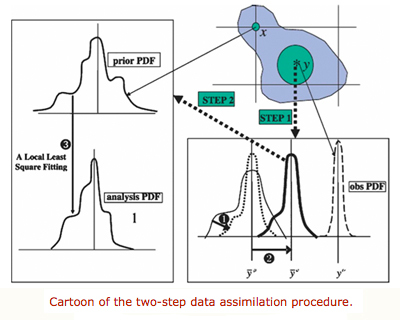 The right-hand column represents step 1: updating the probability density function (PDF) at the observation location as a new observation comes in (denoted by the thick-dotted arrow labeled STEP 1). The solid arrow 1 denotes that the prior PDF at the observation location is squashed by a new observation (denoted by the bottom-right dashed curve) and the solid arrow 2 represents the shift of the prior ensemble mean at the observation location due to the new observation. The thick-dotted arrow extending from the right-hand column to the left-hand column denotes step 2: using the correlation distribution (shaded region) to distribute the observation increments to impacted grid points. The solid arrow 3 represents the process of updating the PDF of a grid point. 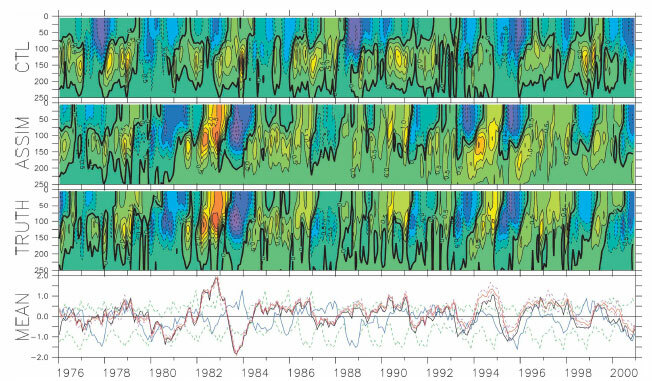 Chang, Y.-S., S. Zhang, A. Rosati, T. Delworth, and W. F. Stern, March 2012: An assessment of oceanic variability for 1960-2010 from the GFDL ensemble coupled data assimilation, Climate Dynamic, Accepted.